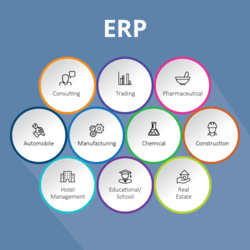 PROSYS ERP - Enterprise resource planning software for all areas of the manufacturing process to automates and Streamlines with greater Adaptability.customized reportiing tool to cater to the various needs of Manufacturing industries which help statistical analysis and decision making. Due to prosperous industry expertise and practice, we are offering Enterprise Resource Planning Service. These services are rendered by expert’s team who has opulent industry proficiency and practice. Moreover, we render this service at nominal prices. Our services are admired for their timely completion. Integrate yourself with the tools you need to cut price, improve efficiency and make speedy decisions faster. That's what you get from Inflate solutions Pvt Ltd ERP software step in, without expensive customizations or make-out long term implementations. And with affectivity, so you can add operational functionality as your business grows. ERP is a software solution used to manage and coordinate all the resources, information, and functions of an organization using centralized database and a common user interface. 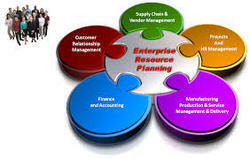 ERP comprises of various modules viz Financial, Material Management, Production Planning, Sales & Distribution, and HRD. Integration between modules & processes is the main attribute of an ERP solution.